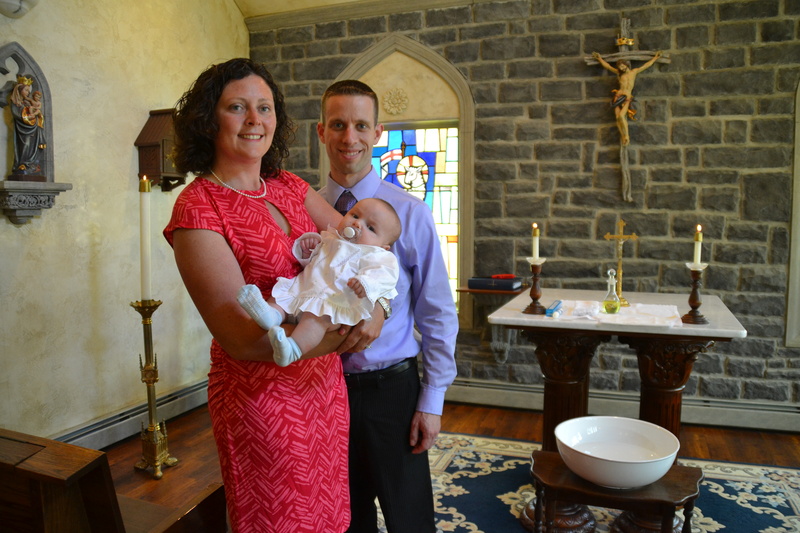 It was a special day for our family the day that Michael was baptized. Not only obviously for the religious reason that we as parents will make sure that Michael is devoted to God but that our whole family was able to get together. We had a beautiful day and a very intimate service because Mike’s uncle is a Catholic priest! It was a very nice service, thank you Uncle Ray! And then we headed out for lunch and I had to have a cake of course. 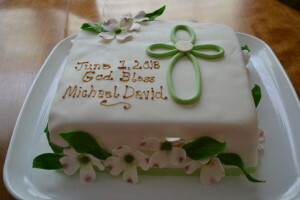 The cake below had some handmade dogwood flowers and leaves on it and a light green fondant cross. The cake inside was a white cake with a raspberry preserve with white chocolate ganache buttercream. It was covered in my homemade marshmallow fondant. My sister helped me finish the cake and I am lucky when she is around to help me work on cakes. I was happy with the cake and it was a great way for me to celebrate this special occasion with my family. 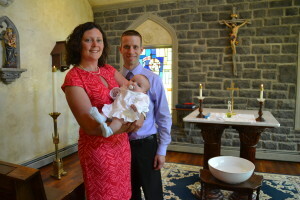 Here is my little beauty with his godparents on his big day!